When it comes to grilling, kabobs are a fun, customizable, and easy way to feed a crowd—especially a crowd with different tastes and dietary restrictions. You can vary the meat and vegetables, and make skewers for the vegetarians in the group. A great tool for doing this is the bamboo skewer; they are inexpensive, readily available, and disposable, making for easy clean-up. If they aren't too charred after use, you can even reuse your bamboo skewers. One thing about bamboo skewers is that they may need some preparation before using. When reading recipes calling for bamboo skewers, you may come across instructions for soaking them in water first. But is this absolutely necessary? There are two schools of thought on whether or not this is a must when grilling with skewers. As we all know, wood is flammable, so the idea of placing a piece of wood over a hot fire can be concerning. Wet wood, on the other hand, has a lower chance of catching fire—hence the recommendation to soak the skewers beforehand. 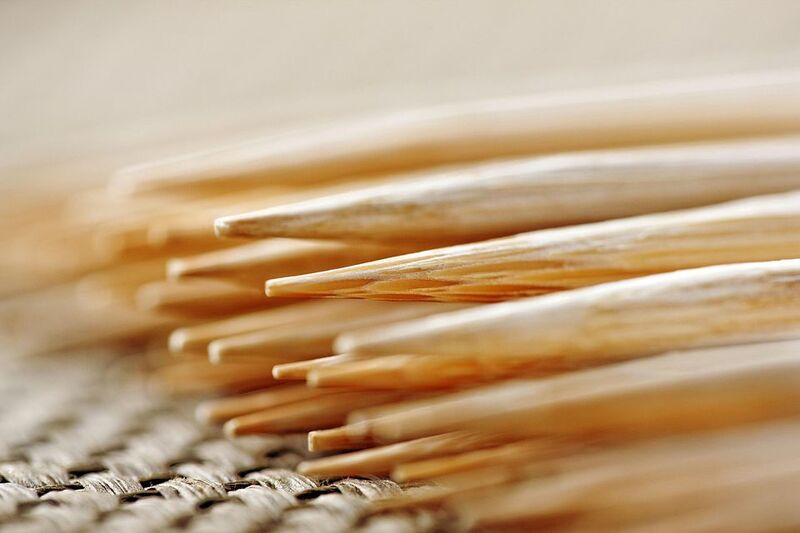 But many chefs and test kitchens have concluded that bamboo skewers will char whether they are soaked or not; the little pieces on the end will burn no matter what, and the main section of the skewer is covered with food and therefore isn't exposed to the flames. But the burn-factor may depend on the thickness of the skewer—the thicker the stick, the less chance it will char. So, if you have thin, somewhat flimsy bamboo skewers, you may want to consider soaking them. Additionally, if you've ever experienced the wooden skewers splitting apart as you are sliding the ingredients onto them, you may want to sit them in a water bath for a bit before using. If you choose to soak your bamboo skewers, you only need a pan large enough to hold them, warm water, and at least 20 minutes. First, fill a pan with warm water and place the bamboo skewers in the water. Make sure the skewers are fully submerged. Allow the skewers to soak for a minimum of 20 minutes, and up to 3 to 4 hours. For a gourmet presentation and an added depth of flavor to your grilled meals, you can experiment with soaking skewers in wine or juice. Just be sure to choose something that will complement the meat and vegetables you are using for the kabobs. Another tip for frequent grillers is to soak the entire package of bamboo skewers all at once so they are ready when you are. Drain well, place in a sealable plastic bag, and stick them in the freezer. They'll keep just fine, and you'll be able to get your kabobs on the grill that much quicker. If all of this decision making and preparation isn't for you, you may prefer to use metal skewers. Many are available in longer lengths than the bamboo, have a convenient handle, and can be reused over and over again. You want to look for the metal skewers with flat edges, as they tend to prevent the food from slipping and sliding around a little bit better than the metal skewers with rounded edges. Just keep in mind that metal becomes very, very hot! Be sure to use a heat-proof glove when removing the metal skewers from the grill. Whether you are pressed for time, realize you don't have any kind of skewer in the house, or just can't be bothered with sliding ingredients onto a stick, you can still cook the food on the grill using a grill basket or the foil packet method. If you own a grill basket, simply place the ingredients in the basket in one layer and put on the grill. Alternatively, you can put the meat and vegetable pieces in a large piece of foil, drizzle with oil or marinade to retain moisture, and wrap up securely. The food will not get any grill marks but will take on some of that smoky grill flavor. The beauty of kabobs is that you can create any combination of meat and vegetable you like using a variety of flavors. In addition, vegetarians and vegans will find skewers helpful for holding tofu, like in a tandoori-spiced tofu kabob, seitan, and vegetarian kabobs in place on the grill; skewers are also great for grilling cheeses.